In C++ Two Dimensional array in C++ is an array that consists of more than one rows and more than one column. In 2-D array each element is referred by two indexes. Elements stored in these Arrays in the form of matrices. The first index shows a row of the matrix and the second index shows the column of the matrix. When we type the above statement the compiler will generate a 2-D array of a matrix which consists of 3 rows and 4 columns. In order to store values in a C++ two-dimensional array, the programmer has to specify the number of rows and the number of column of that array. To access each individual location of a matrix to store the values the user has to provide the exact number of row and number of column. The 2-D arrays which are declared by the keyword int are able to store integer values are called two-dimensional integer arrays. The process of assigning values during declaration is called initialization. These Arrays can be initialized by putting the curly braces around each row separating by a comma also each element of a matrix should be separated by a comma. IN this case, your compiler will automatically locate the first three values in the first row and the last 3 values in the next row. now, in this case, the value of the first row is clear as well as the value in the second row. IN the above example values has been assigned using accessing individual location. in this case, the value of that array has been populated at run time. Nested loop is used to enter data in 2-D arrays. It depends upon the programmer which loop he wants to use it could be While loop or it could be a For loop. The outer loop acts as the number of rows of a matrix and the inner loop act as the number of columns of a matrix. The above portion of a code uses nested F loop to assigns 5 to all the locations of a matrix of a two dimensional array in C++. in this case your compiler will automatically generate a total two rows as it will divide total elements with three and result will be its rows. as in this case, your system will not be able to calculate the total number of columns and will result in a syntax error. The blank declaration is not allowed. Not allowed as ‘n’ is not defined. Since double dimensional array is most of the time used for solving matrix type problems thus sometimes programmer call it ‘matrix’ so they love to display double dimensional array in a tabular format. C++ Program to read a double dimensional array integer of order 3×4 . 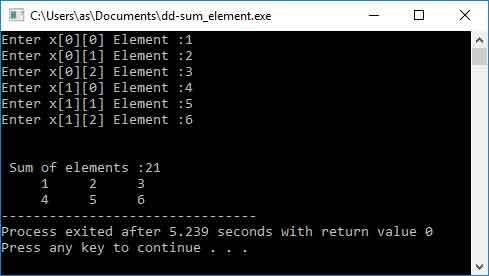 Find out the sum of element and then display entered array as well as sum of these elements on the screen. Q1. Write a program in C++ to read an array of the integer of order 3×4. Find out the sum of only those elements which is either divisible by 3 or 7. Display sum of these elements and entered array in tabular format on the screen. Q2. Write a program in C++ to read an array of an integer of order 3×4. Find out the sum of each row. Display sum each row as well as the entered array in tabular format on the screen. Q3. Write a program in C++ to read an array of an integer of order 3×4. Find out the sum of each column. Display sum each column as well as entered array in tabular format on the screen. Q4. Write a program in C++ to read an array of an integer of order 3×4. Interchange the elements of the first row with the last row of this array. Display this newly created array in tabular format on the screen. Q5. Write a program in C++ to read an array of an integer of order 3×4. Give an increment of 20 to each element of this array. Display this modified array on the screen in a tabular format. Q6. Write a program in C++ to read an array of integers of size 4×4. Display lower triangular matrix of this matrix on the screen. Q7. Write a program in C++ to read an array of integers of size 4×4. Display upper triangular matrix of this matrix on the screen. Q8. Write a program in C++ to read an array of integers of size 4×4. Display diagonal matrix of this matrix on the screen. Q9 Write a program in C++ to read a matrix of integers of size 4×4. Find out Transpose of this matrix and display this newly created Transpose matrix on the screen. Q10. Write a program in C++ to read two matrices A and B of order 3×4. Find out the Addition of these two matrices. Display Both entered matrix as well the sum of these two matrices on the screen. Q11. Write a program in C++ to read two matrices A and B of order 3×4. Find out the subtraction of these two matrices. Display Both entered matrix as well the sum of these two matrices on the screen.